A capsule summary of this book's plot would make it sound like a thousand other epic fantasies: a thousand years ago, a terrible dragon called the Nameless One tried to destroy the world, but was imprisoned; soon he will return, and a group of heroes will have to defeat him once again. What sounds like a cliché when boiled down to a single sentence becomes a good deal more nuanced in the actual text. Part of Shannon's great strength here is her worldbuilding, which draws recognizably on real-world countries (specifically England and Japan), but goes well beyond simply changing a few names, working in new elements that distinguish Shannon's world from actual history. In the equivalent to Europe, for example, the religion is the Six Virtues, which owes more to the ideals of medieval chivalry than to Christian theology itself. People in Inys and other western countries take as their holy patron the Knight of a particular Virtue, such as Fellowship, Courage, or Justice. On the other side of the world, Asian-style dragons are revered instead of being demonized as objects of destructive force, with social structures built around their role in society and their partnership with specific humans. Shannon also avoids the usual trap of this type of story, in which a prophecy predicts what is going to happen, and turns out to be accurate in every respect. Hers is a world where no one person or group holds the precise truth: everyone's beliefs are flawed in some fashion, shaped by history or political expedience. Virtudom claims that the Saint who founded their religion, Galian Berethnet, defeated the Nameless One; in the titular Priory, they credit that deed to Cleolind Selinyu, who in Virtudom is seen not as a warrior but as Galian's helpless object of rescue; in the East the story makes no mention of either Galian or Cleolind, saying that a comet empowered their dragons to bring the Nameless One down. These disagreements mirror the messiness of real-world history and religion in a satisfying way. It's also noteworthy—though at this point it shouldn't be—that much of the key action is driven by women and characters of color (categories that often overlap in these pages). Two of the four point of view characters are men, and they distinctly play a secondary role compared to the female viewpoints; that latter pair, Eadaz du Zāla uq-Nāra and Tané Miduchi, share the spotlight with characters ranging from Inysh queen Sabran Berethnet to the half-legendary Witch of Inysca to the pirate queen known as the Golden Empress. The story doesn't go out of its way to trumpet their agency; it simply takes that concept for granted, with pleasing results. The novel's main weakness comes in its second half, where the story begins to feel rushed. The first half develops its conflicts with rich detail, but after the midpoint things that could have formed entire complex subplots often get disposed of with a single straightforward effort. New locations, like the Priory or the Empire of the Twelve Lakes, appear only briefly in comparison with Inys or Seiiki, and characters and factions with deep-seated grudges against each other readily lay them aside as soon as the danger mounts. The disappointment this creates is, more than anything, a measure of how well-developed the first half is. The advance reader copy of this book is 804 pages long; Shannon's plot contains more than enough material to make two or three substantial novels, if everything had been given as much room to breathe as the early beats. Then the revelation of the truth of the past, and its metaphysical underpinnings, would have carried as much weight as the politics introduced at the start. 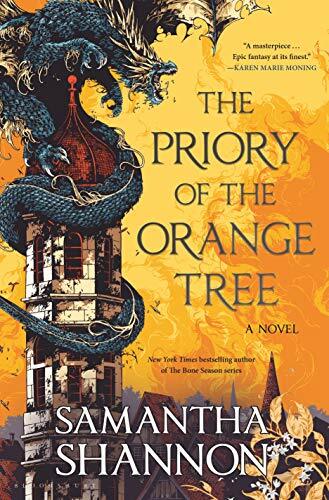 Despite that rushed feeling as the story enters its second half, The Priory of the Orange Tree is a fascinating epic fantasy set in a rich, well-developed world. Shannon has created fertile narrative ground, and the state of affairs at the end of this novel certainly leaves room for new stories that will make further use of the excellent setting.